I haven’t used it often in the last months, but it lately took back all its utility. I took out my little blue jacket to protect myself from the cold in the high mountains around Pasto. Almost no wrinkled while it was pack as a ball in my luggage, it then served right to protect me from the rain. 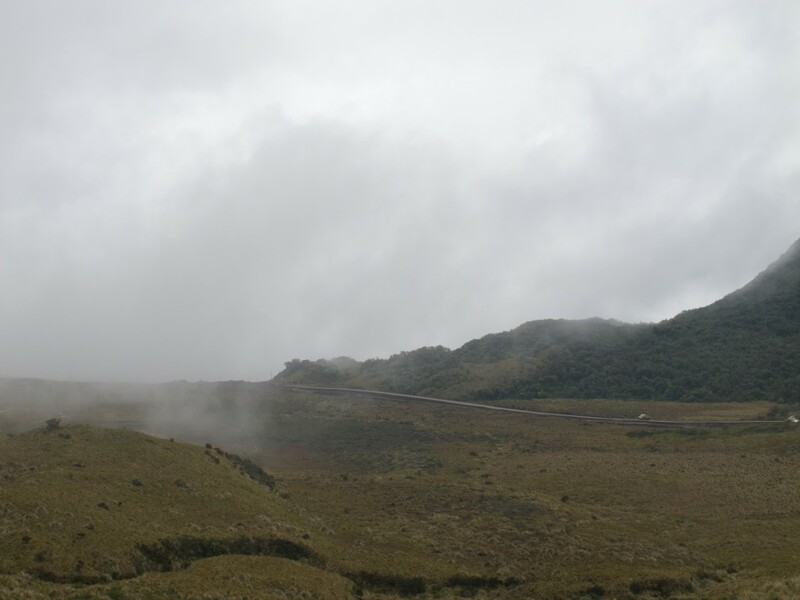 Lower, it was getting to hot, sweating more inside than anything else, so it was better to refresh from the Amazonian rain, but back in the mountains in Ecuador, the rain will go on, and I will be happy to be protected from this fresh Andean wind. Leaving Cali and its valley already with nostalgy, I was throwing myself in what people here call “the knot”, the place where the Occidental Cordillera meet the Central one (the Oriental and the Central merged a little bit more North). Here I am in this mountainous mess, on a road trying its best to find a way to climb (and go down, and climb again) in this labyrinth. 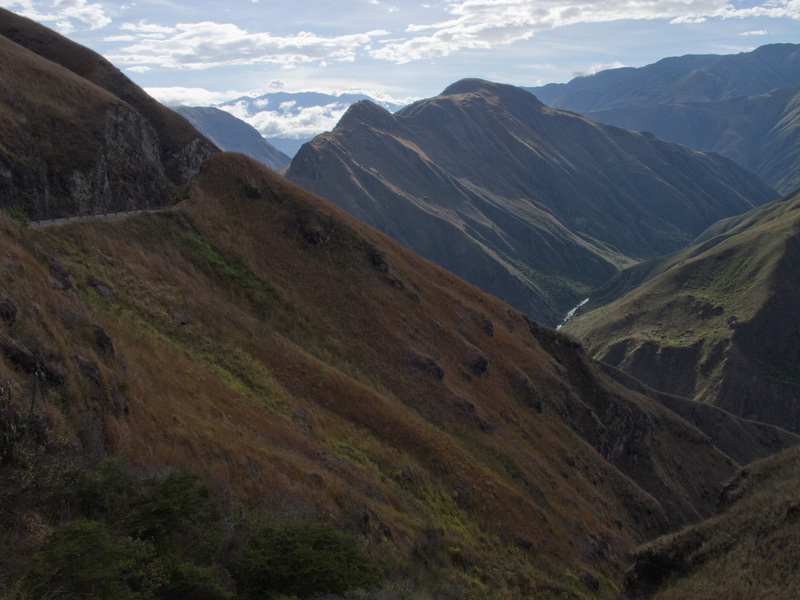 From Pasto, where I spent a few unusual days with Franciscan nuns, whom the Superior was the sister of my host in Medellín, the Panamerican goes to the Ecuador border through the mountains. 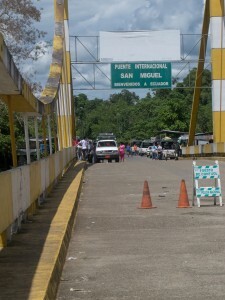 However, I decided to leave the main road to go down to the Amazon basin and cross the border at San Miguel. It’s a rare occasion that I can take on my itinerary to see the Andes from this side, and even if I won’t see the mythic Amazon river, I’ll find myself in the wet jungle cut by wide river draining to the Amazon. Moreover, I’ll cross two more times the Continental Great Divide! Manuela’s family in Medellín is from this area, which is called Putumayo. 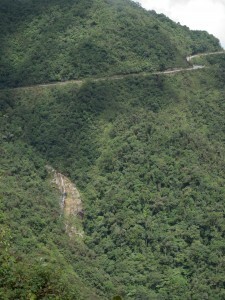 Before going all the way down, the road winds through Sibundoy Valley, where her brother hosted me. 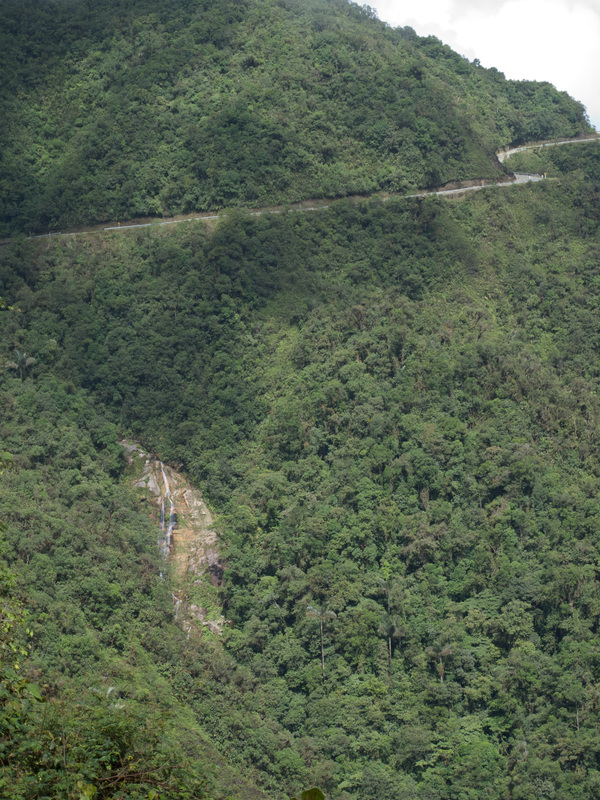 Then, it’s needed to cross what’s left of cordillera, on a thin dirt road, where white crosses remind the people that it doesn’t need a lot to fall down the cliff and tumble a few hundred meters. I won’t be able to make it to Mocoa, where a son of the brother lives, and I’ll sleep in a road maintenance workers camp. I did well to sleep up there and don’t start venture down while the sun was setting, because the downhill was as though as the uphill. I had to avoid rocks, always brake, crossing by foot creeks in curves on the mountain slope, and all that under the rain. But in the distance, I see a straight line. I am almost there. From up there, the Amazon seems flat, but it’s far from that. After many green hills, a town shows up, and an other one later, thrilling on the oil boom of the area. 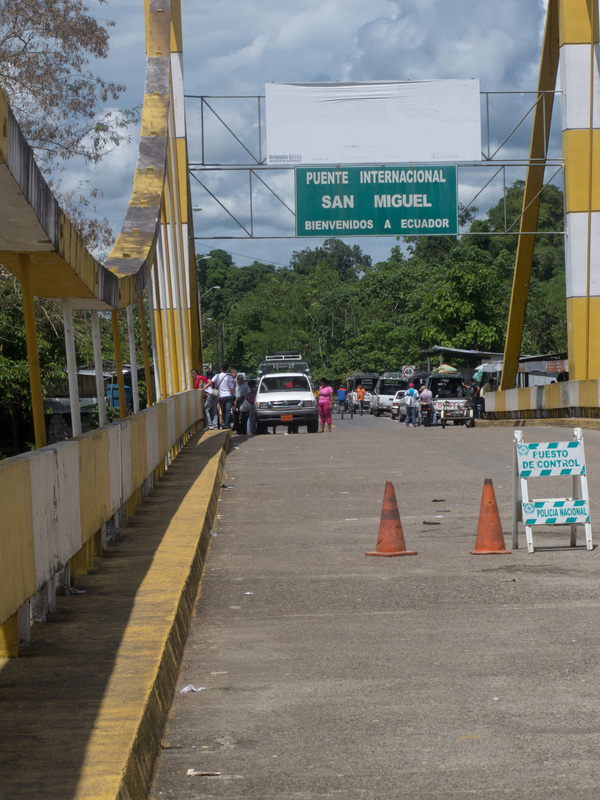 Even if I’ve seen a lot in Colombia, it was the first time I got stopped at a military checkpoint. Where are you from, where are you going, on bicycle, really? He says to me to turn right at the next town (which was what I was about to do anyway), as going straight would have brought me in possible problems. The main road is safe and patrolled, but a few area are more at risks. A few years ago, the Colombian military killed the FARC’s number 2… in Ecuadorian territory. Moreover than creating a little diplomatic crisis with their neighbor, the situation in the Putumayo degenerated. Now, capital is getting attracted again by petrol exploration, giving job, money and an illusion of order. Pumping station are surrounded by militaries and at a few spots along the pipeline following the road, I see scars from explosions, darkening the road and the trees around. At one place, houses around didn’t resist. The road to the border is not all paved yet but in construction, as this link is seen as a commercial way to help the area to get better. I spend my last Colombian night hosted by an other brother of that family. On the bridge over the river used as a border, my passport is being asked. The young militaries, with a joyful tone, happy to see a foreigner passing by there, shot me with thousand of questions about my trip. The one holding my passport, a little bit too much excited, kick his bottle that falls in the river. I ask my passport back before he throws it in the river as well. Anyway, the administrative formalities are two kilometers further, peacefully and quickly done in a quiet common building for both countries. 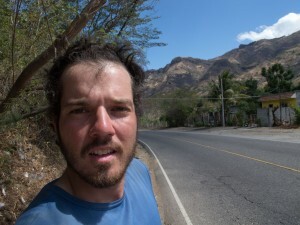 Here I am in Ecuador, on a nice paved road. I change my Colombian pesos for US dollars, used here since the 2000 decade. I go on, on a road cut by bridges going over wide brownish rivers, navigating through this green environment where birds making distinct sounds bring me out from my solitude. It will be needed to go back up soon. It’s very beautiful here, but it’s wet, everyday it rains, not continuously, but enough to break down moral. At least, as the sky is covered, it’s not too hot. Those few days have been enough. 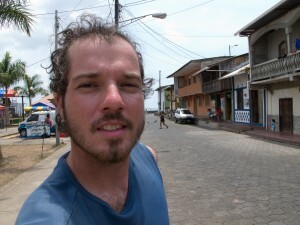 I stop to spend the night in Baeza, at the intersection of the road which will bring me up to Quito’s suburbs. In a shop, close to the gas station, a man calls me, asking where I am from. He lived 20 years in Toronto, tells me about the son he has there, invites me for a coffee and after a few stories, invites me to shower and sleep at his place. Climbing up the pass bringing me back in the Andes was though. It was my first pass over 4.000 meters. Baeza being at 1.700 meters, the climb was over 2.300 meters over 60 kilometers of road. My shoes, wet since a few days, was freezing off my feet as I was going up. 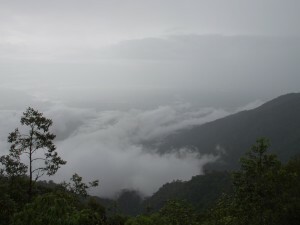 After the first hours climbing towards the clouds, I eventually get into them, and it’s from there that things worsen. 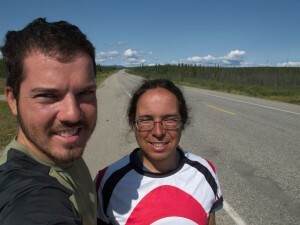 Traveling by bicycle for a long period is more a psychological challenge than a physical one. It wasn’t good fun to wander on this road as if I was blind, cold cloud’s drops sticking in my face, without seeing the next curves, even less an antenna that generally tells you where the top is, without knowing where I was going. It’s in those moments of psychological weakness than the legs seems heavier, that the breath seems shorter. I then stop often to rest a bit, but it brings the top even further. I eventually get on the other side of the cloud, to discover a world without tree, that surprised me as I haven’t seen the transition. The Amazon seems so far from here, but it’s just beside. I went around Quito, the capital, hoping to rest in Ambato, where a man owning a bike shop take care of his casa de ciclista, hosting bicycle travelers. The rain goes on a little bit every day. 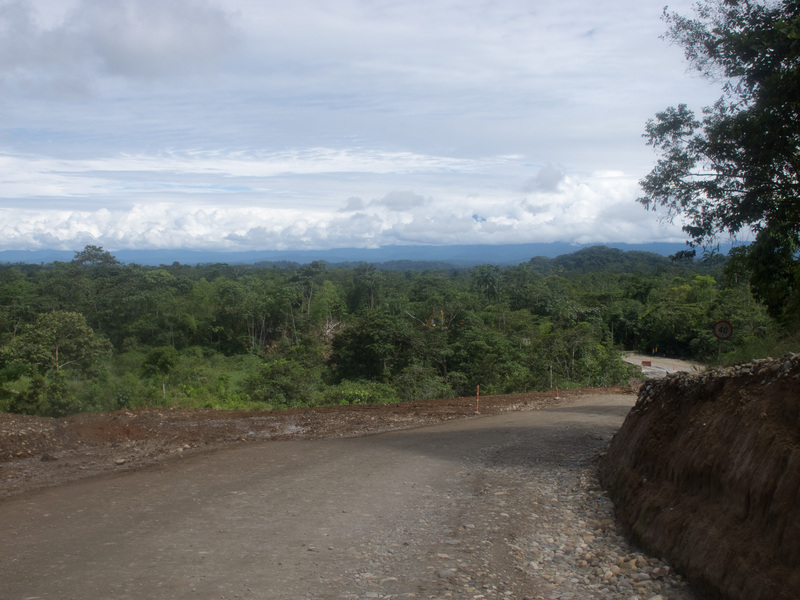 The Avenida de los volcanes, (The Volcanoes Avenue) won’t give any of it’s charm. The cloudy roof just let me imagine the splendor over those conical bases that I see raising in the clouds. Better to go ahead under this climatic conditions, in this country where finding a flat segment of road over 100 meters is a challenge! This entry was posted in 10. Colombia, 11. Ecuador by CycloExpedition Americas. Bookmark the permalink.